Shared Conversations let you share a conversation with teammates or people outside of your organization. 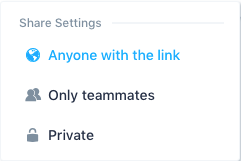 It also comes with sharing permissions, so you can control who can view your conversation even if they have your share link. You will see a small window appear with your share link. 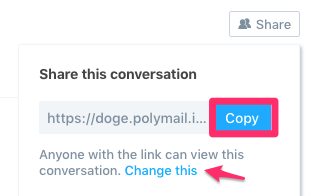 You can copy the link by clicking the blue "Copy" button. By default, your shared email can be viewed by anyone with your link. Anyone with the link: anyone who has this link can access it, whether you yourself send it to them or they receive it another way. Only teammates: your fellow Polymail team members will be able to view this conversation upon clicking this link. People who are not part of your Polymail team cannot view this message, even if they click on your share link. Private: only collaborators who have been specifically mentioned by you in a Polymail comment can use this link to view this message. You can change your sharing permissions for your shared conversations at any time. Made something public that should be private? You can change your permissions to "Private" whenever you'd like the same way you originally set it. Once you do, anyone you previously sent your link to (who was not included in a Mention) will no longer be able to access this conversation.